This 18 x 24\" print is the perfect gift for the history buff in your family. 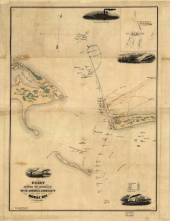 Published in 1864, this map depicts the movements of Rear Admiral David Farragut in the Battle of Mobile Bay. Published shortly after the battle itself, this map provides a complete visual demonstration of what took place during one of the most critical and oft studied naval battles of the American Civil War. 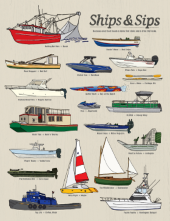 Because every boat needs a name that clicks and a drink that kicks...This 11x14 print is the perfect addition to your beach house or man cave.